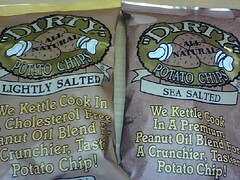 I like the Lightly Salted Dirty Chips in the little café where I work. A two-ounce bag has 50 mg. of sodium per serving. A serving, I had noted, is half a bag (1 ounce), a fact that I’m sure sails right by most people, who assume a serving is the full bag. Gotta read those nutrition facts! Well, the other day, we got in a new supply of Dirty Chips. But these were Sea Salted instead of Lightly Salted. I looked at the sodium count and sighed – 170mg per serving, far too salty for me (although not as bad as some brands, I realize; this is, overall, a good brand for us gourmands). But wait! I looked at the top of the nutrition label and saw that for this variety, the suggested serving was the whole two-ounce bag! Now, if you divide 170 by 2, you get 85 milligrams of sodium per ounce, which isn’t too bad. But how can they claim a serving is two ounces on some varieties and one ounce on others? Aren’t serving sizes supposed to be standardized to avoid this kind of, let’s call it “inconsistency,” in nutrition labeling? Hey Dirty Chips – What’s up with that?? Having been a food stylist for a so-called food firm in the 1960’s, [when Tang and Kool Pops made their way onto the the scene (and I called them in our staff evaluation “colored water and no mother in her right mind would buy them for her children”,] I am not surprised at these deliberate confusions, Faith. All this reading of ingredients is just another reason to buy real at Farmers’ Markets, as you have been teaching us forever. However, I want to know, why ‘dirty’?